Your UMSU candidates. Photo provided by Your UMSU. Two candidates from each executive slate in the UMSU General Election sat down with the Manitoban after the first week of campaigning to answer questions about their stance on various issues important to students. Jeremiah Kopp, candidate for president, and Rebecca Kunzman, candidate for vice-president advocacy, spoke on behalf of the Your UMSU slate. Jeremiah Kopp, president: The student union’s responsibility is to create and facilitate the best, and most memorable, most exciting student experience possible, and represent the interest of students to administration, to government, and [in] all facets of student life. Kopp: We’re really excited about our promises to open up a Shawarma Khan, and a Green Carrot [Juice] smoothie bar in University Centre, on UMSU street, just like we did with UMSUshi. We want to take that same business model [used for UMSUshi]. [Shawarma Khan and Green Carrot Juice] will be fantastic food options on campus, as they’re affordable, sustainable, healthy, and great tasting. M: What would you do to improve the campus experience? Rebecca Kunzman, VP advocacy: What we did this year was revitalize the campaign structure. I think what it does is engages more students than we have in the past, and it also enables students to have their voice heard. The intent behind the new structure for the campaigns is to empower students to create positive change within themselves, the campus, and the community. Rather than having the union dictate what interests the students have, it lets the students have the interests, and make their interests heard, and let UMSU support them, and give them the resources to be able to do that. 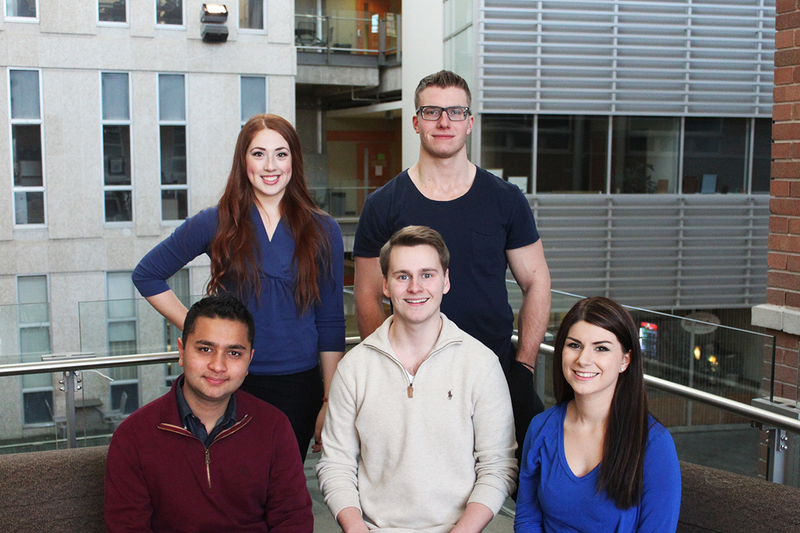 M: What is UMSU’s future with the Canadian Federation of Students? If elected, would you look at leaving the CFS? Kopp: The University of Manitoba Students’ Union is at the forefront of student associations around the country, in terms of driving policy, driving advocacy, driving the student experience on all levels, whether it be social programming, or campaigns. We’re going to continue to do that. We would work with any organization that wants to get on board with our campaigns, with our advocacy, and with any events that we have. M: What makes your slate the best group of candidates for the executive seats? Kunzman: I think it’s a combination of things. Obviously Jeremiah and I both bring a lot of experience to the table, having been in our positions previously, and having seen the inner workings of UMSU. Beyond that, I think that the experience that each of the members has really lends to creating that student experience, because we’ve all been involved from the get-go, and this isn’t something we picked up last week. Our first year here, we were involved in campus life in a very big way, and we really know what it takes to make that experience better for everyone else, and we look forward to doing that. Kopp: Your UMSU is firmly against any cuts to the university, and we also understand how the provincial government has put this university in a very tough place, because they haven’t lived up to their obligations, and haven’t matched their promise of funding the university budget to the tune of five per cent, and instead has been set at 2.5 per cent. Now the university is in a very tough position. We’re going to continue working with the university administration in a respectful dialogue, where we’re at the table, in the room, and advocating for the best interests of students. Kopp: I think the main role of a student union has to be facilitating the voice of the students. We are there to support any student who has a cause, or issue that they want to be passionate about, and we have significant resources that we can put behind that to help spread the word. At the end of the day, our team’s approach is very grassroots, it’s very bottom-up, and we want the students to be the voice behind any political campaigns or advocacy. We won’t be trying to shove any one view down the throats of students. Kunzman: I think we’ve really done a lot this year to restructure and recreate the backbone of what will enable a positive student experience. I think next year, if elected, it would just be a matter of continuing to embed that in the student experience.